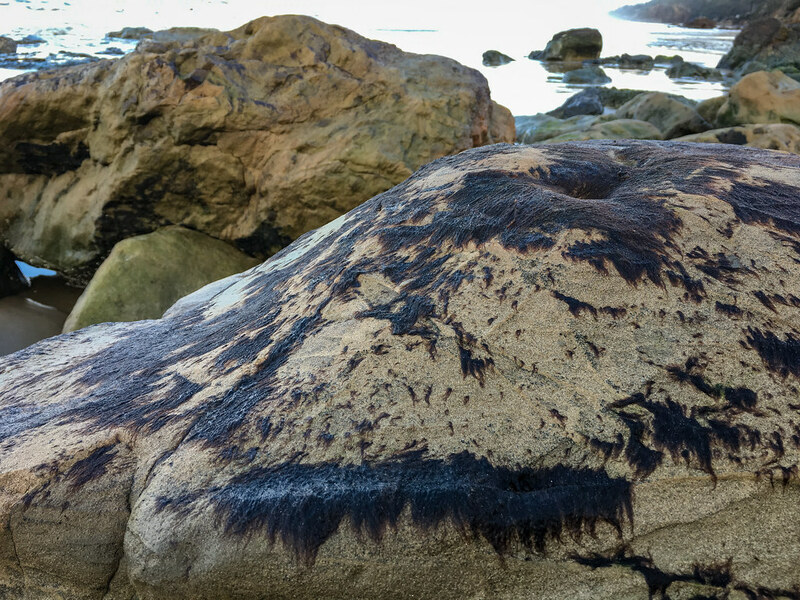 Bangia-like filamentous reds are a naturalist’s delight in the exposed upper intertidal, where they favor the tops of rounded boulders and rocks. The filaments of these inscrutable reds wave in the swash like thinning human hair, soaked and windswept on a blustery day. When the surge recedes the filaments fall limply, like a mop or a bad comb-over. Bangia evokes amusing similes at every phase of the tide. You’ll find creative descriptions of Bangia‘s hair-like character in each of the references cited below. The image above, from March 19, 2019, does a good job of conveying Bangia‘s look and habit. 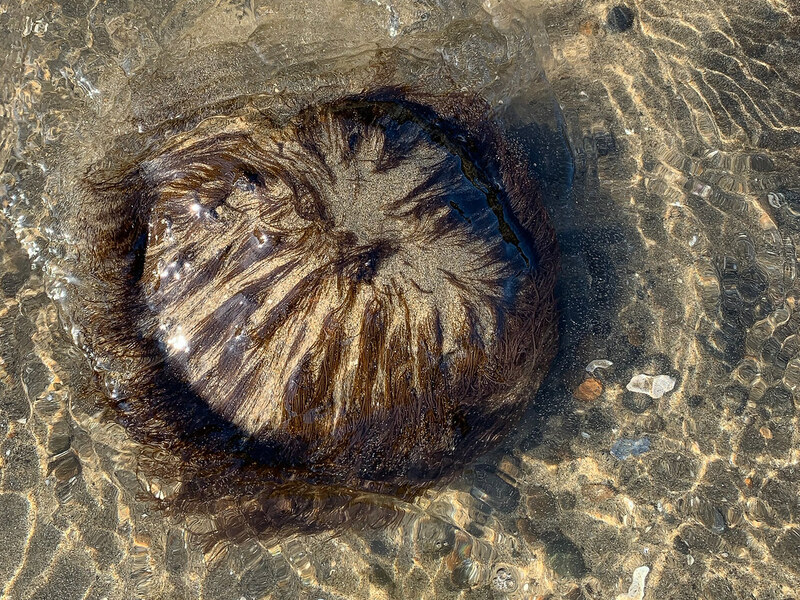 Standing in a field of rounded high intertidal rocks, I found the play of the filaments in the shallow swash mesmerizing while I daydreamed of descriptions I had read about Bangia‘s resemblance to thinning human hair. The short video below captures the essence the Bangia-human hair resemblance. I hope you enjoy it. You’ll notice I use Bangia and Bangia-like interchangeably in this post. It’s nestled in a complex of filamentous reds that need more work. You can get the scoop in the account by Druehl and Clarkston (2016). As for common names, bangia seems fine to me. Bald sea hair, a pleasingly odd combination, also makes sense. The resemblance to thinning human hair is equally strong when the filaments become exposed by low tides. Dry filaments turn black, or nearly so, accounting for another common name, black sea hair. Below is a different look at bangia, this time exposed on a large, less head-like, rounded boulder. You can find my photographic take and a few words on Pacific coast reds, including more bangia, on my Reds page. Ha! That’s good. The only colors I’ve seen are purplish-brown (wet) and black (dry). Look for it on rounded rocks in the high intertidal. I think I see it most in late winter and spring, but that might just be me. Though I did read that it disappears (goes completely bald) sometimes.